Bristol, TN/VA is a unique place. “Two States; One State of Mind” is their motto, but navigating two sets of building regulations, garbage pickups, tax codes and general government type operations can get a bit confusing. However, Christina Blevins, executive director of Believe in Bristol, Bristol’s Main Street organization, bridges the gaps everyday in a positive, energetic and infectious manner. Her coalition’s building skills recently paid off when Mumford & Sons were looking at communities in which to hold their traveling Gentlemen of the Road music festival. 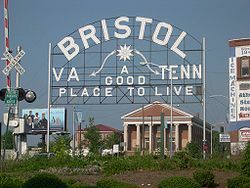 Already known worldwide for the Rhythm & Roots Reunion and as the Birthplace of Country Music, Bristol had an inate attraction for the band. However, the ability to coordinate the many moving parts that an all day outdoor festival requires, in addition to the evenings music selections across the street (and consequently across the state line), Bristol cinched the deal. Already, Bristol is getting tons of press about this event, but the real lesson is to be prepared when opportunity knocks. Keep building relationships, offer value to all of your partners, understand the needs of your stakeholders, offer assistance without reservation and become indespensible. Read more about the festival here, here, here, here and here. Discounted tickets are on sale June 1.